Since people are not much aware of this new venture it is a golden chance to create a commotion on regular restaurant going customers. Excluding very few movies and cities, food truck business is a new field, where foodpreneurs can venture into. Since people are not much aware of this new venture, it is a golden chance to create a commotion on regular restaurant going customers. Food Truck Business lies in the beauty of the food being cooked in a truck, which runs on the road and food is also being cooked in the truck. So one has to decide whether he/she wants to buy a new truck or customize an old truck as per requirement. It is always a good idea to invest in the idea of constructing your own food truck rather than decorating the readymade food trucks. Many companies manufacture trucks as per demand but that might drill a hole in your pocket. If you are not confident enough about the customized old truck, then you can opt for the company made ones. Either way, it shall be an initial investment for your dream business. Licenses, permits and all the required documents are important for any food business. You can approach a consultant for what and all documents are required and how you can get them. Since your food business is going to be on wheels and to be stationed in different places, it is important to carry all the permits safely before stumbling into any legal loopholes. Since the basics necessities to start your venture are done and dusted, it is time to focus on your primary function that is deciding the menu. You surely must have well thought over the food you are going to serve in your food truck business. 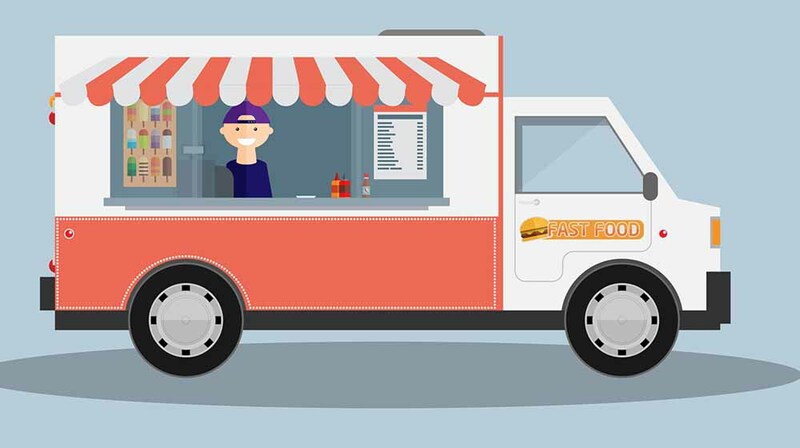 Since it is a food truck, you also have to work on offering a variety of items to your customer as your business is not location bound. Also, you have to keep in mind, what all types of equipment you can carry in your truck and how will they function. You need supplies of vegetables, fruits, meat, fish, chicken, and other grocery items to start your food truck venture. So make sure to never run out of supply especially when customers are lined at your food counter. Keep contact numbers saved of multiple suppliers handy. Since it is your baby business, you get to decide who will drive the truck, who will cook and how many assistants you will require, running your business smoothly. Decide the manpower strength you would be requiring. A set of experienced chefs, well-behaved waiters, hardworking cleaners and a non-alcoholic driver are the basic minimum people you would have to hire to give you a helping hand. You can hire as many people you can provide shelter to. You are your own advertiser, so you can run around your truck with a banner of its own painted or flagged on top of the truck to let the people know about your venture. Food trucks are not that common in India, which will work in your favor, so send advertisements on all other Medias available to create good enough excitement among the people. You can also run contests to keep the flame of excitement among customers alive.